Like Salt Lake City’s other two “Temple” streets, North Temple was originally intended to lead one to Temple Square, as the designated center of cultural and religious life. Unlike the other two streets, however, North Temple is often thought to be not just a pathway to the temple from residential neighborhoods, but an avenue out of town—whether to the Salt Lake International Airport or following the highway all the way to Wendover—as well as an entryway into town from the west. An exhibit at Mestizo Institute of Culture & Arts titled On North Temple Street, curated by Erik Daenitz—a former City Weekly staff photographer who has recently shot for The New York Times and The Wall Street Journal—looks at the thoroughfare through the camera lens and provides insights from the unique perspective of the visual medium. A collaborative project between professional photographers and amateur students, the show is also in some ways an essay about the act of looking at the world around us. With the North Temple/Airport TRAX line opening this month, the show is timed perfectly to look both back at the street’s history and forward at the changing landscape of the area, as well as our city as a whole. Daenitz says that, in addition to the cultural diversity, “The North Temple viaduct is a well-known symbolic and geographic divide between the North Temple of downtown and the rest of North Temple to the west. While State Street, another grand boulevard, may also have a great mixing of cultures, this graphic distinction between spaces doesn’t exist in the same way in any other part of the city. He wanted to offer amateur artists the experience of being mentored that he valued during his own development as a photographer. “The thought of inviting amateur photographers to participate was spurred by my desire to open up the photography conversation beyond a single group of photojournalists or photographers,” Daenitz says. The assembled photographs do seem to function in conversation with one other. Daenitz says that the varying perspectives mirror the cultural diversity of the area. 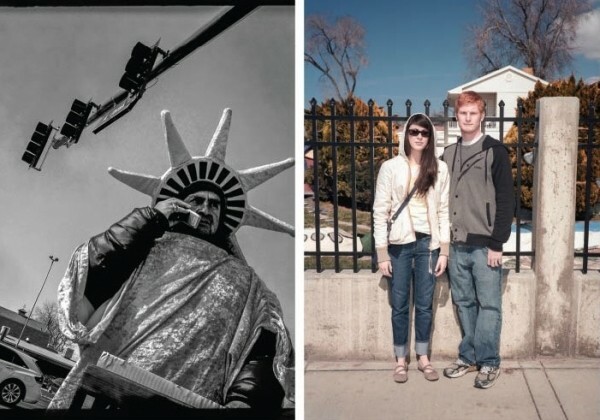 “The act of empathic behavior is potentially mirrored in our work, as it is a mental exercise that requires an individual to explore life from different perspectives.” These range from Trent Nelson’s “Hostess History Tryptich” and Grayson West’s “Goodbye Hostess,” which look at a historical landmark, to Chris Oakley’s “Poles” and Christopher Ayers’ “Crane,” which both examine the industrial infrastructure of the street, to Daenitz’s seemingly straightforward views of residents of the area and construction implements, which may reveal more in their glances at mundane details. The show is another artistic touchstone in a long line of culturally significant exhibits for Mestizo, located just west of the North Temple overpass, at the “gateway to the west side.” The exhibit has the potential to generate some healthy discussion about the transformations the area—and downtown Salt Lake City as a whole—is undergoing and will continue to undergo in coming years. The images include a nice balance between the impressionistic and hard realist visions, contemplations of past, present and future. Gallery Stroll reception, April 19, 6-9 p.m.